Jam shouldn’t be hard or scary. This vegan recipe for Raspberry Chia jam is very easy to make. It requires only 3 ingredients and cooks in under 5 minutes. Many of you may be asking, what is Chia? Chia is a seed from a plant that resides in the mint family. It is native to Central America, but can be grown in California and Mexico. They are an excellent source of omega-3 fatty acids, rich in antioxidants, and they provide fiber, iron, and calcium. Jam shouldn't be hard or scary. 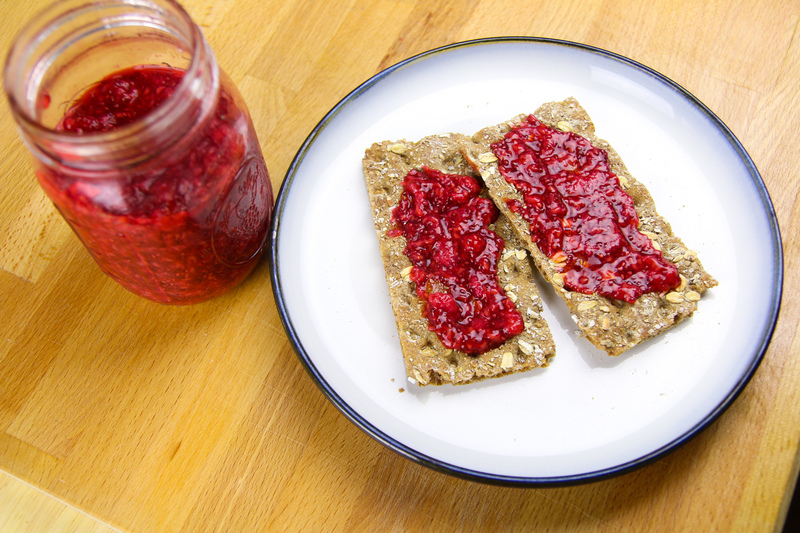 This vegan recipe for Raspberry Chia jam is very easy to make. It requires only 3 ingredients and cooks in under 5 minutes. Place raspberries in a medium sauce pan. Cook on medium heat for 5 minutes. Your raspberries should release most of their juices. You can use a spoon or ladle to help crush them while they are cooking. After cooking for 5 minutes, add chia seeds, and agave / maple syrup. Mix until well combined. Pour jam into a mason jar or air tight container. Allow to cool at room temperature before placing into the fridge. The jam will last fro a little over a week or you can freeze for up to 3 months. Enjoy on toast, in your peanut butter & jelly, or even in one of your favorite cocktails.